We have come in peace to collect your penguins. We are taking them to a better place. Not too terribly long ago, I was perusing through my blog’s logs and stumbled across a search string that I found rather intriguing. It read “Alien abductions frogs from Antarctica.” At first, it struck me as an odd query, but as I looked through scientific articles on the web, I realized that there was genuine concern about the diminishing population of emperor penguins in Antarctica. The scientists attribute this phenomenon to climate change, but could the depletion in the number of penguins be attributable to alien abductions? Could the alien frogs have observed the melting of the glaciers and the breakup of the ice shelves and concluded that the best way to save this cherished species would be to transport them away to a safer place where they would enjoy better protection? 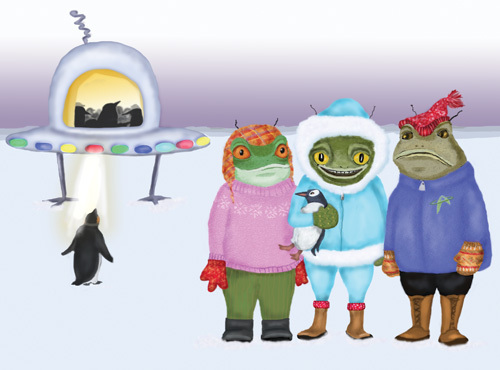 I can only speculate that on the alien frogs’ planet, penguins are a highly appreciated species, and periodic expeditions are sent out around the galaxy to collect them and bring them back as pets and mascots for the frogs. Jack Frost nipping at your nose? 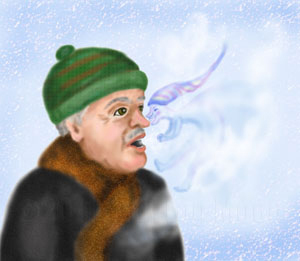 Is Jack Frost nipping at your nose? It’s really cold outside and you can feel the bite of the frigid air. In recent days, the country has been beset by a brutal cold wave that has dropped vast amounts of snow and ice upon the land. Schools are closed, flights have been canceled and people have been stranded in their cars on the highways. In some major cities, life has virtually crawled to a standstill.